Looking for a good laminotar for home or office? 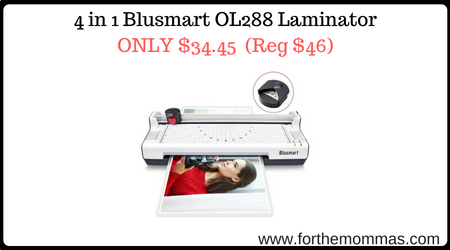 Score 4 in 1 Blusmart OL288 Laminator, A4, Rotary Trimmer/Corner Rounder/10 Laminating Pouches, White for ONLY $34.45 Shipped (Reg $46) in the Amazon deal of the day 08/25. Laminates in 160mic(2 x 80mic) – 250mic(2 x 125mic) pouches with 230mm throat entry.